Samantha Tiki Doll. 1990s tooned-up Samantha doll ornament from Electric Tiki. 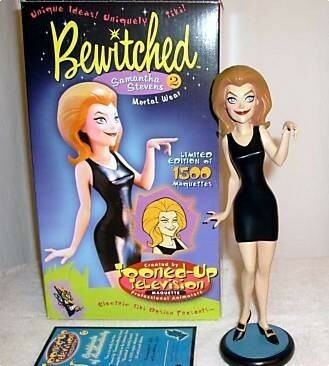 They also made a Samantha in witch's outfit and a Serena doll.. Wallpaper and background images in the hechizada club tagged: bewitched elizabeth montgomery samantha stephens collectibles electric tiki toys. She looks a bit creepy ,eh? Really witchy expression,lol! It doesn't do Sam justice,she looks very mischevious to say the least! You're right. The way they did the eyes and mouth is creepy! Oh, my! She looks like some sort of evil character from that old Hanna-Barbera SuperFriends cartoon!